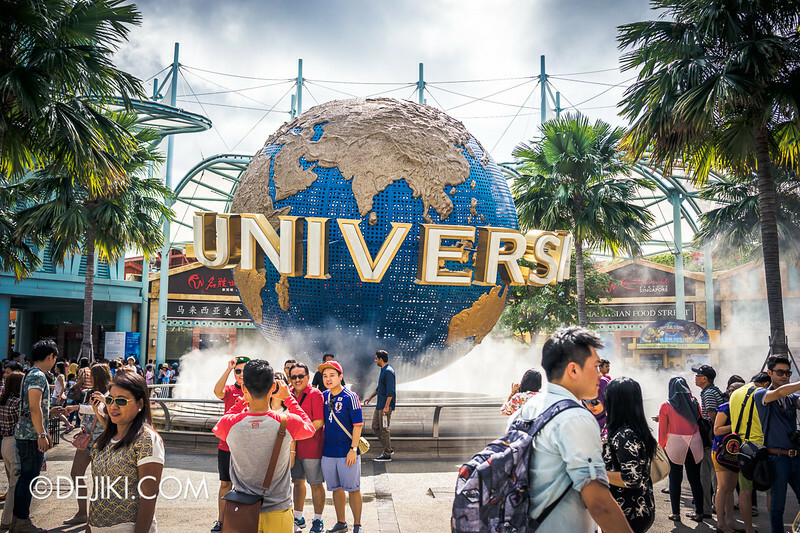 It’s the June school holiday season and there are exciting news from Universal Studios Singapore. Read all about it in this month’s USS Park Update! 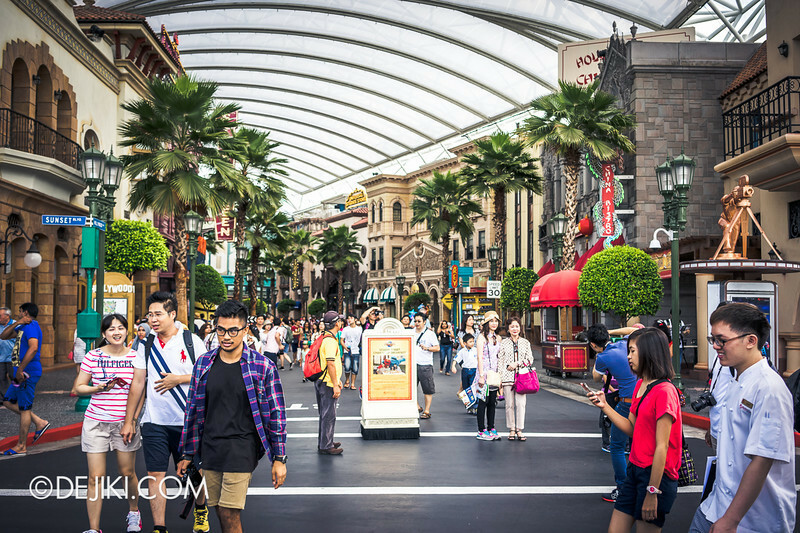 Japanese Prime Minister Shinzō Abe was in Singapore to tour the two integrated resorts – Marina Bay Sands and Resorts World Sentosa. 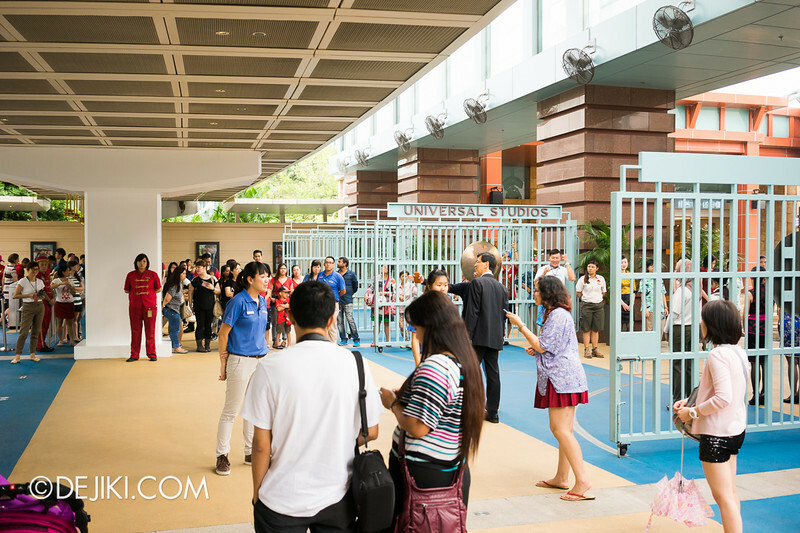 While the tour was focused on Singapore’s unique IR model of casino resorts, the Prime Minister visited some attractions around RWS, such as the S.E.A. 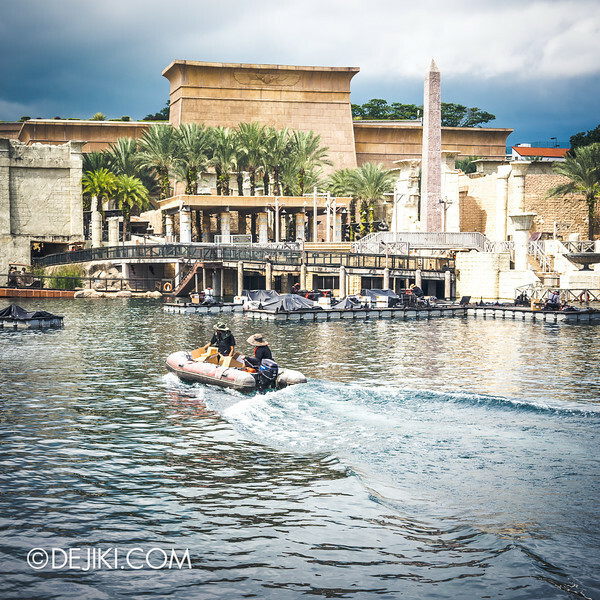 Aquarium and Universal Studios Singapore. Special arrangements were made at the park entrance, as the central fence was removed to extend the boulevard to the park’s iconic archway. 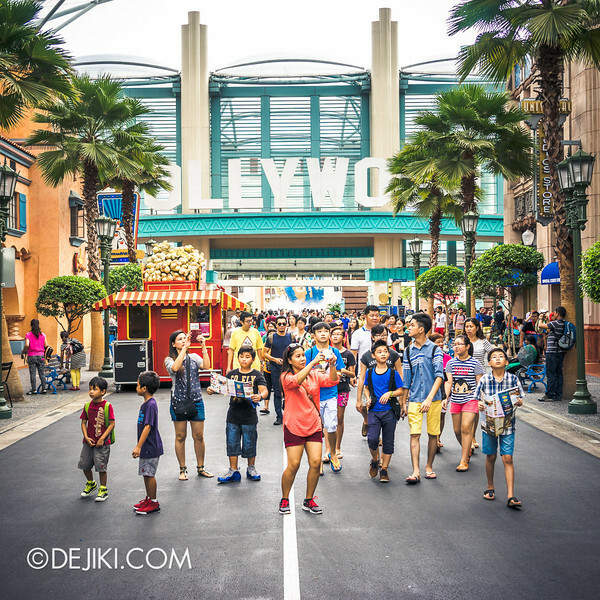 Crew members from RWS Attractions formed two lines at the park entrance, waving at the buggies filled with Japanese delegates. 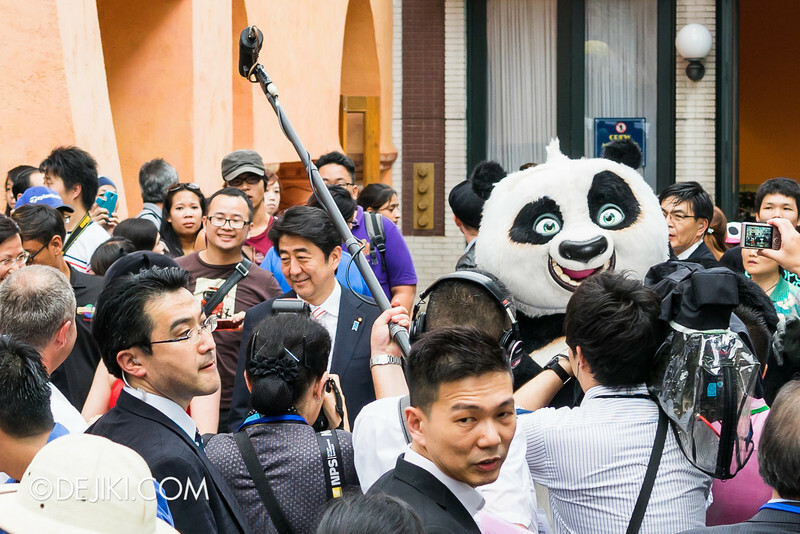 The Japanese Prime Minister had a short pitstop before leaving USS – a photo op with some of Universal Studios Singapore’s iconic characters. 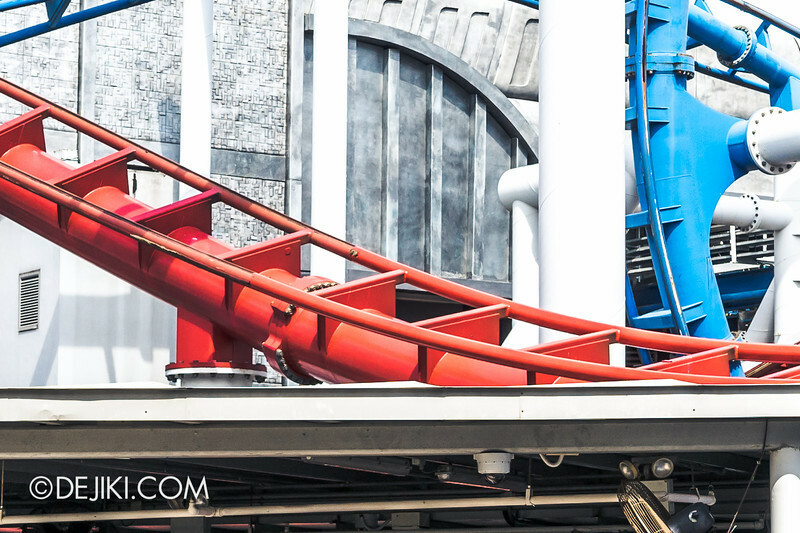 It appears that the mystery surrounding Battlestar Galactica rollercoaster will only be lifted when the ride reopens (either as its old self or with some other theme) sometime at the end of the year. 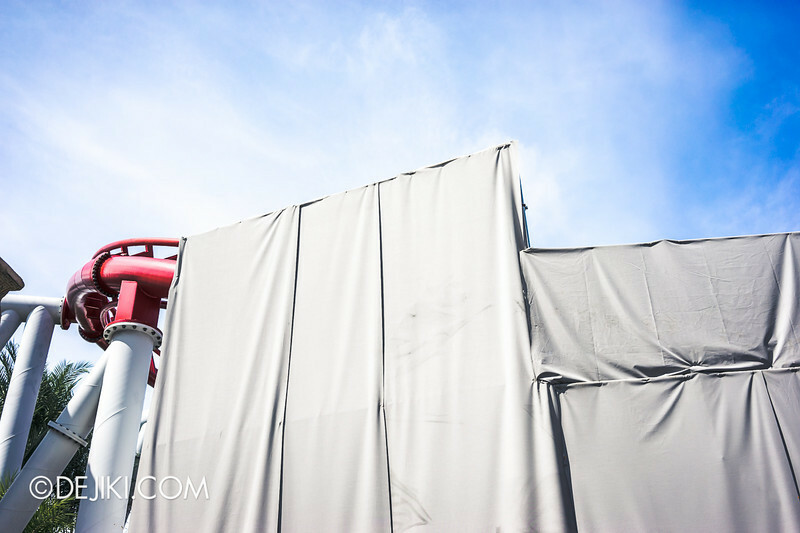 For now, scaffolds surround the ride entrance of Battlestar Galactica: HUMAN and the nearby red track segments. The infamous banked turns loaded with positive G-forces. 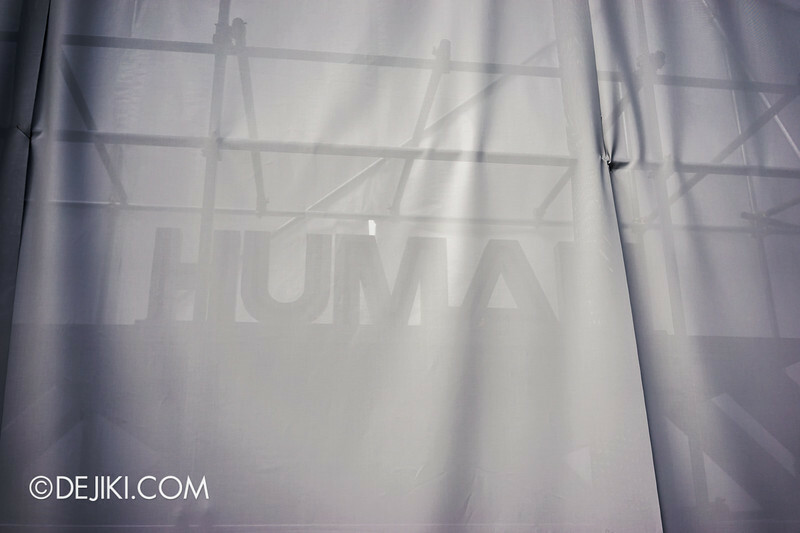 Despite being covered, the HUMAN sign is still there. There are certain sections of the red track that are inconsistently coloured with the rest. Either these track segments were replaced, or the park has repainted them. The wear marks have magically vanished at some spots. 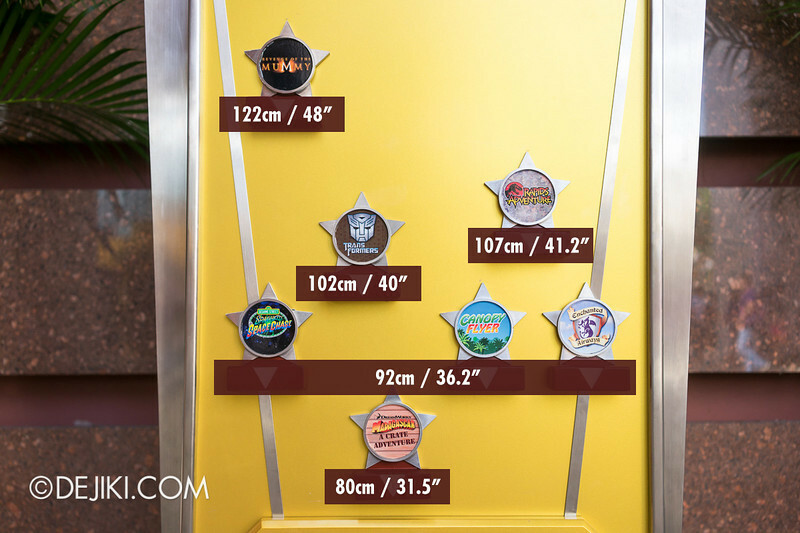 A few weeks ago, this handy height board was installed at the park entrance. Handy, as school’s out and the park is full of young children. 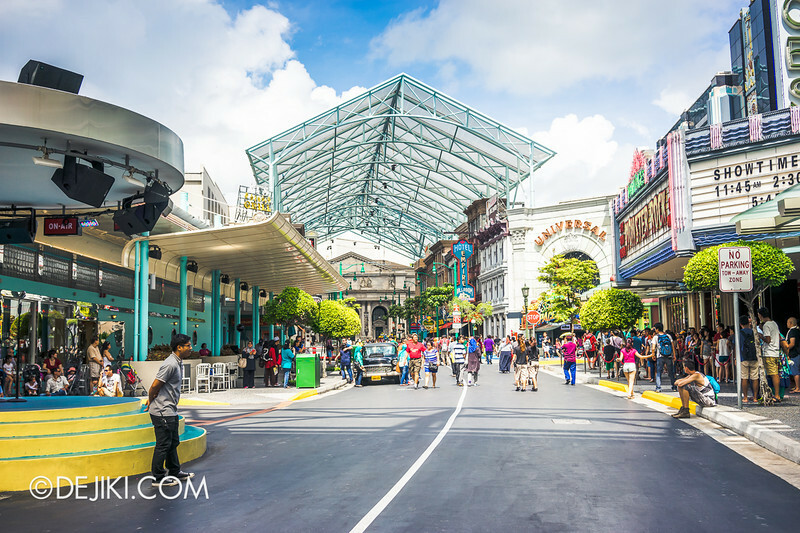 The streets are bustling with guests! It’s been a while since I’ve been to the park when it’s this full. 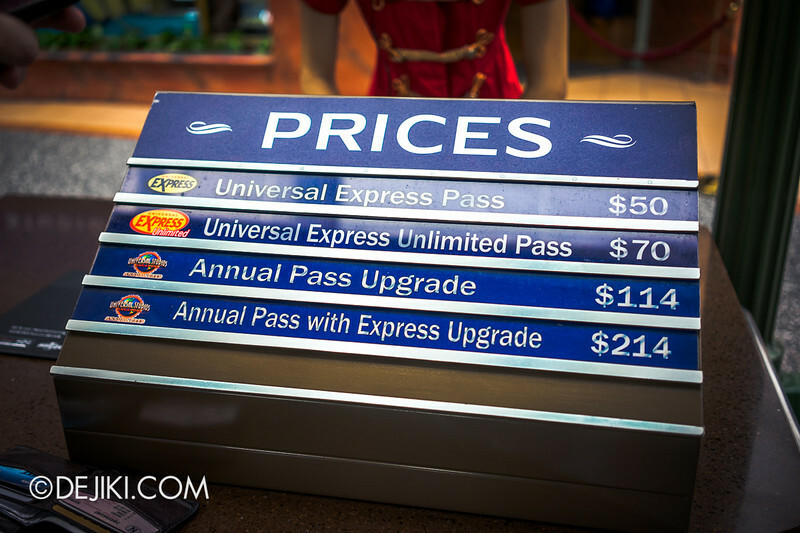 As this is one of the park’s busiest period, the prices for the Universal Express Pass are tagged at Peak rates. 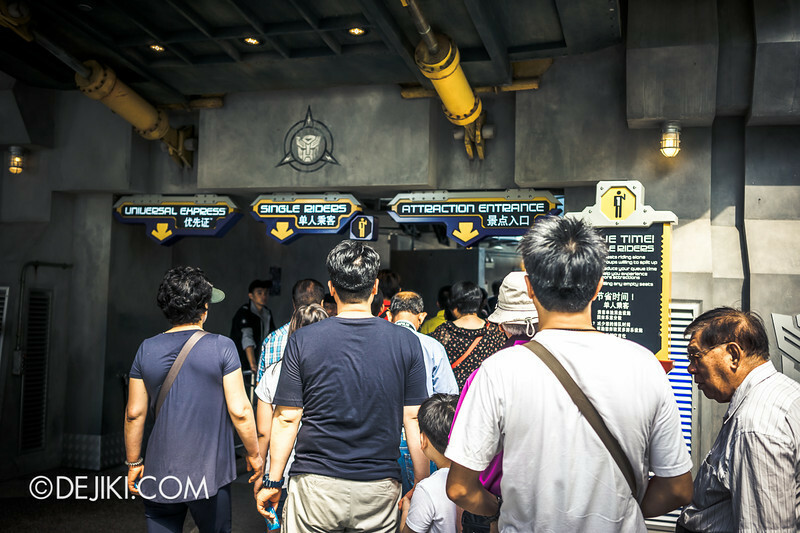 At noon, Wait Time for most rides hovered around 30-45 minutes, with Transformers: The Ride being the exception with a 90-minute wait. 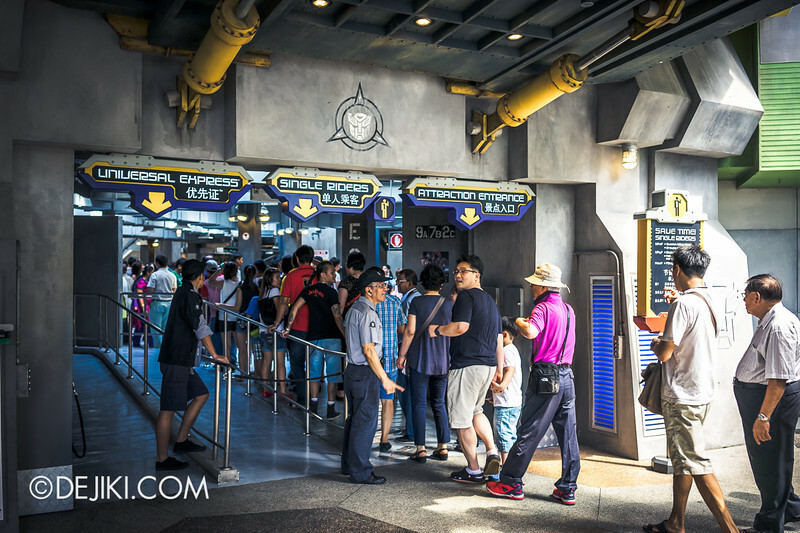 It is very possible to clear all the park’s rides without Express Passes, but if you only have a few hours to spare, then consider getting the Universal Express Pass. 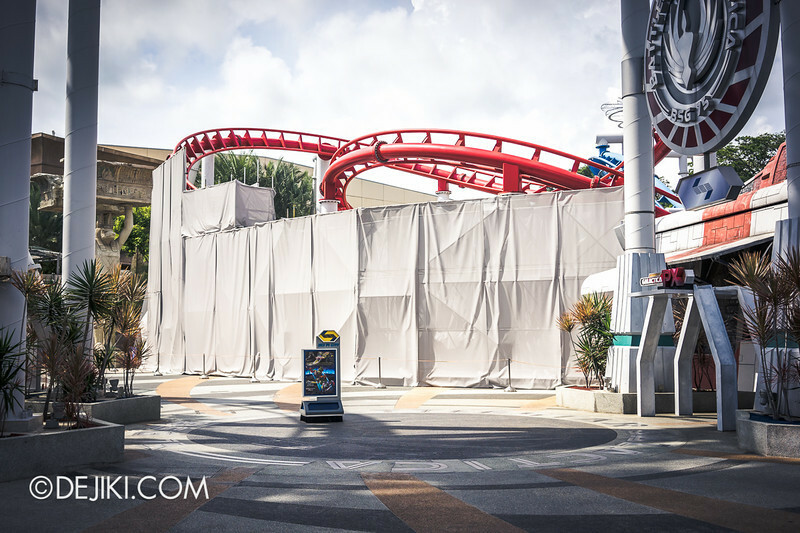 It looks like the park did not expect everyone to just walk into Transformers. 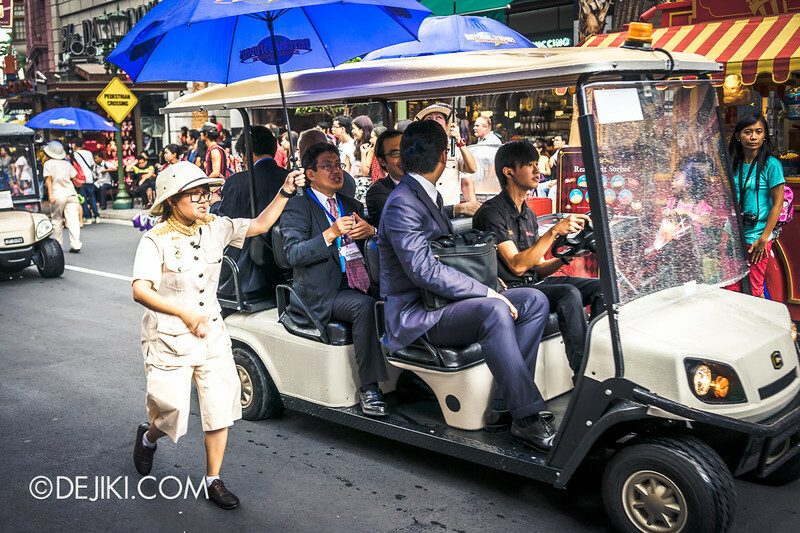 The guests overwhelmed the typical line, and the queue trailed onto the streets of New York. 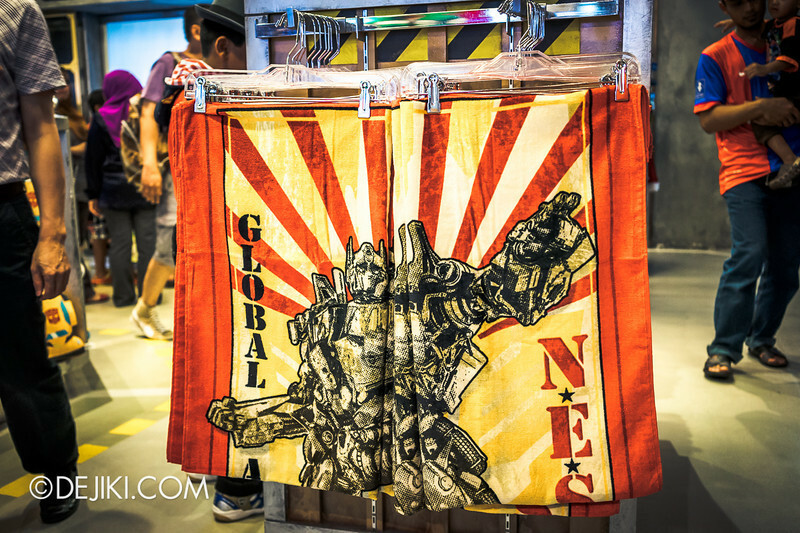 This Transformers NEST Towel is on sale now at $19.90. After visiting Tokyo DisneySea during summer, I’d say that such large towels are a good buy. Surprisingly useful in the sun and rain. 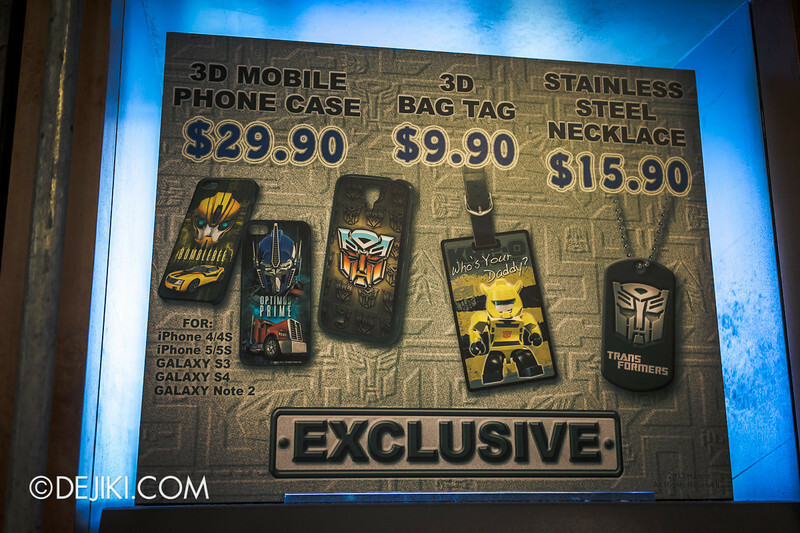 An assortment of USS-exclusive Transformers items. 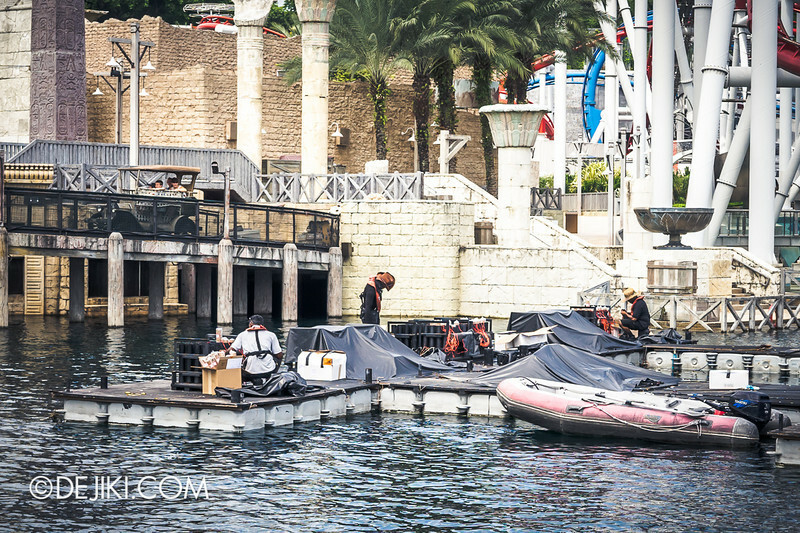 On Saturday mornings, you might catch some park crew at Lake Hollywood, preparing for the Lake Hollywood Spectacular pyrotechnics show (8pm, most Saturdays). 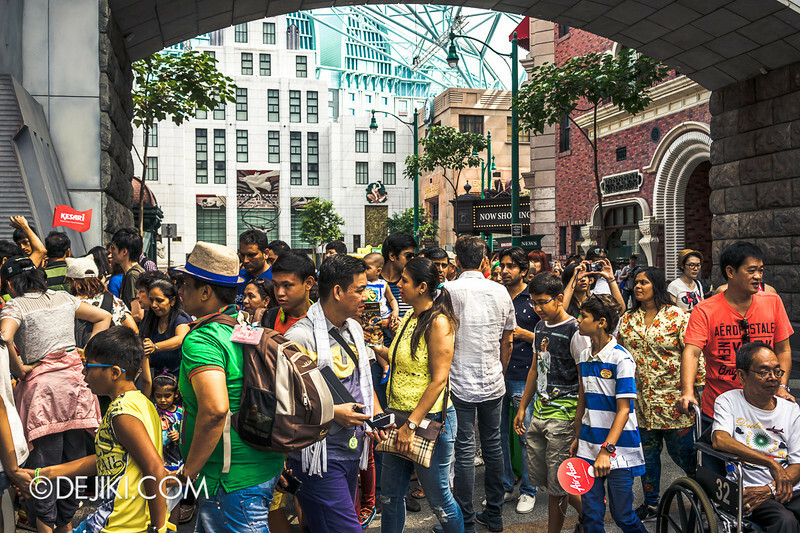 Just about every other zone has Meet-and-Greet happening, one right after another. 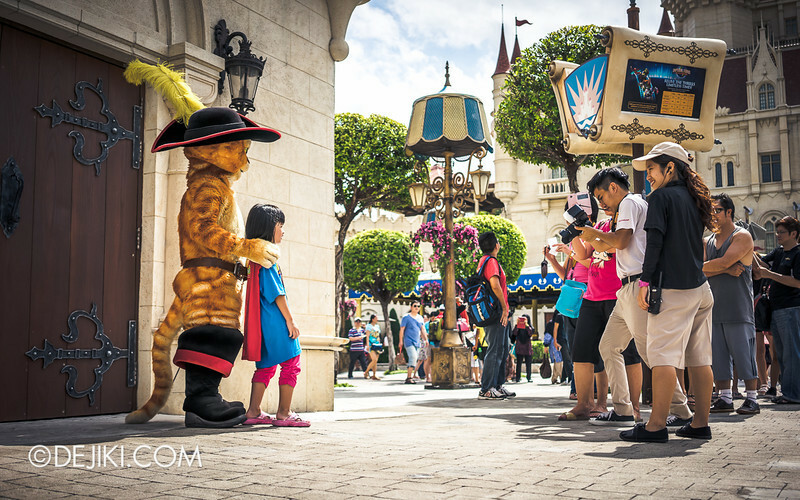 Expect lines for almost every character! 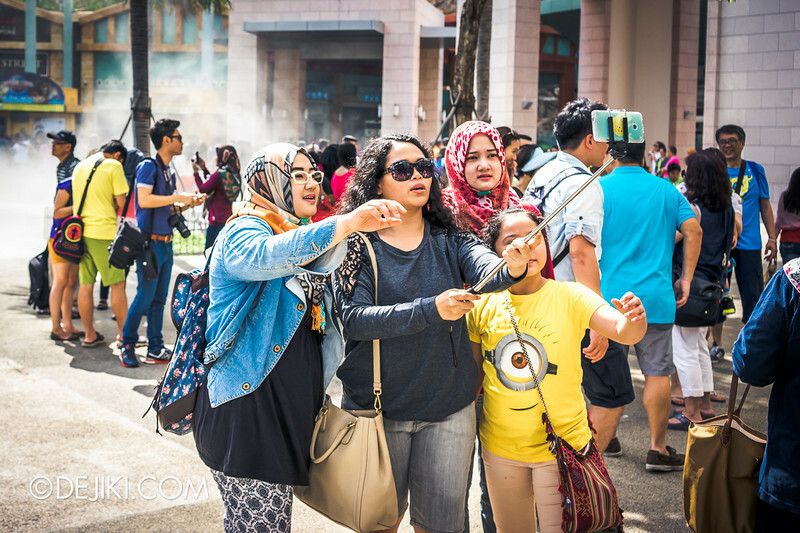 The Selfie Stick (or Monopod) is almost a must-have accessory to bring to the park. It was one of those days where the weather cycles rapidly between sun and rain… in mere moments. Just minutes after this photo was taken, it started to pour at the park. 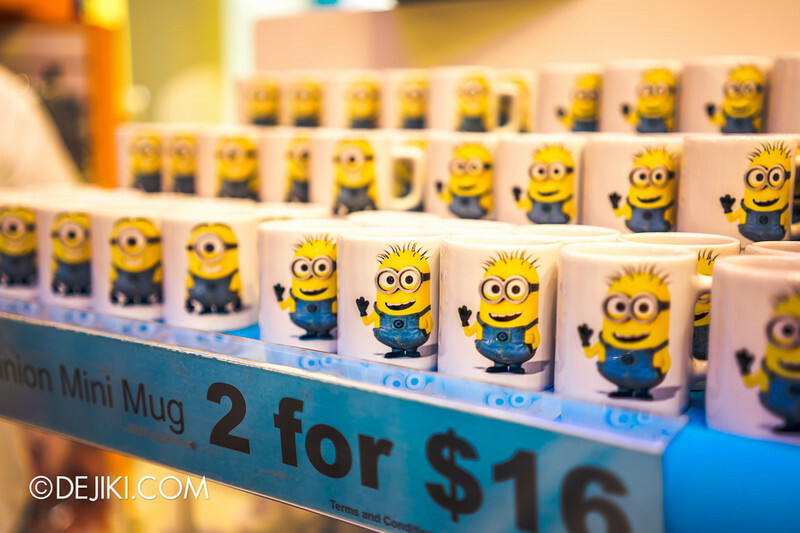 The Minion Mini Mugs are now going for $16 a pair. 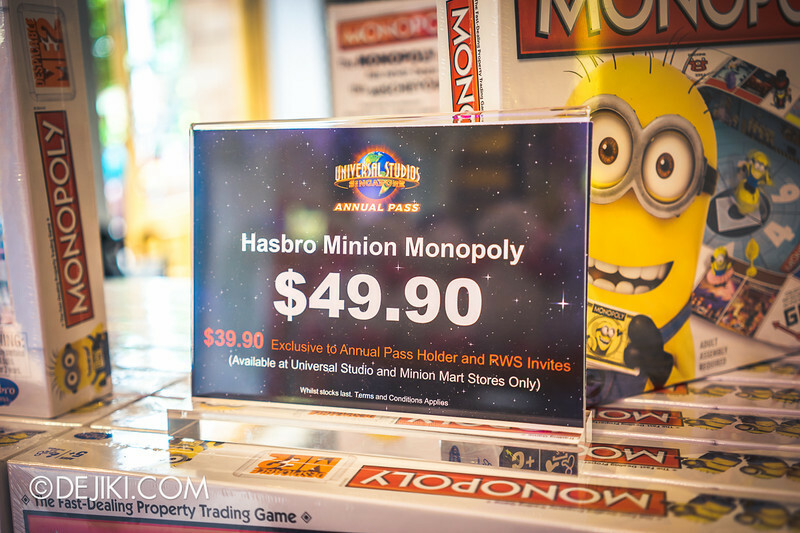 One notable item that has landed at the park recently is the Monopoly Despicable Me 2. 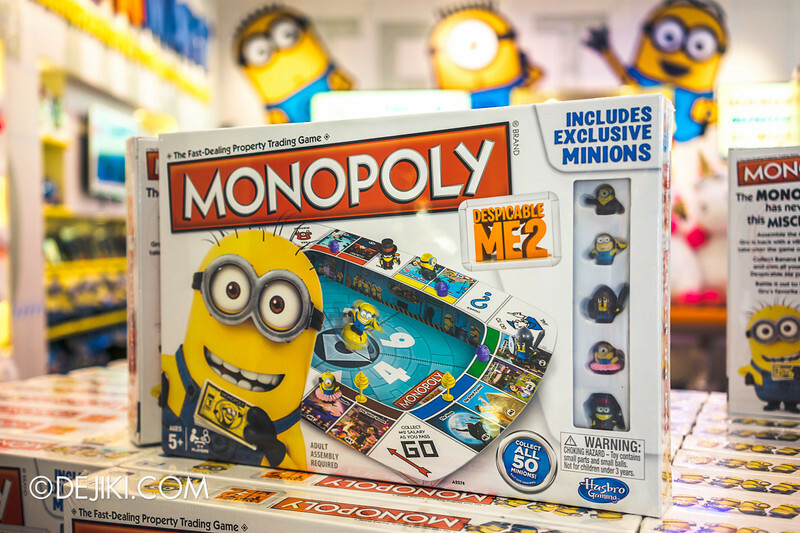 It features a non-standard Monopoly board with a unique design, along with unique currency (Banana Bucks) and tokens, such as these collectible mini minions. $49.90 per set. 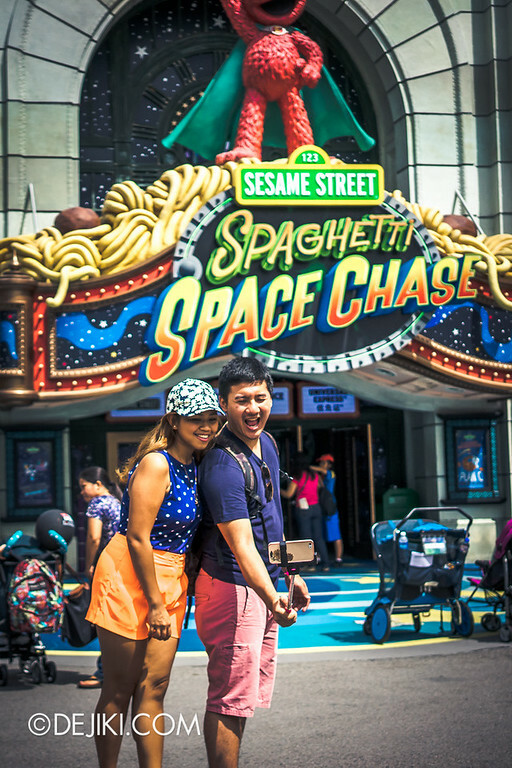 USS Annual Passholders and RWS Invites Members can enjoy a $10 discount. The rules of the game are heavily simplified. Obviously this would be the perfect gift for kids (Ages 5 and up) who are too young to play the classic Monopoly. 5 Minions are included, but you can always get more. 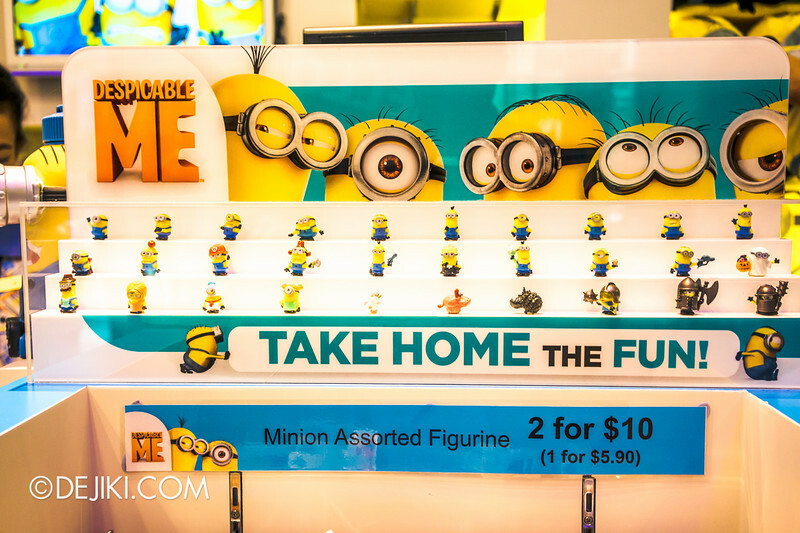 You see, these minions are also sold in another game called Battle Pods Game. 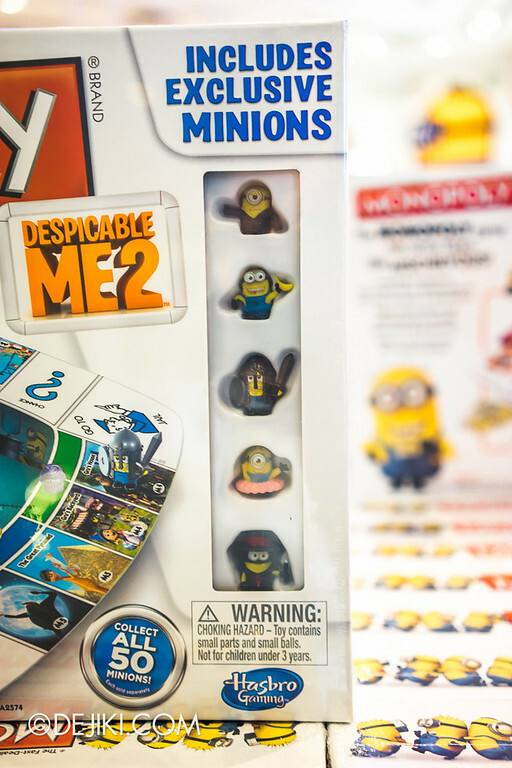 They are in “blind bags”, so you won’t know which minion you get until the packs are opened (after they’re paid for, please). However, if you wish to have the full collection of 50 figurines, you’ll have to buy other toys and games, because only another 31 different figurines can be obtained via the Battle Pods Game blind bags. $5.90 a pack, $10 for two. 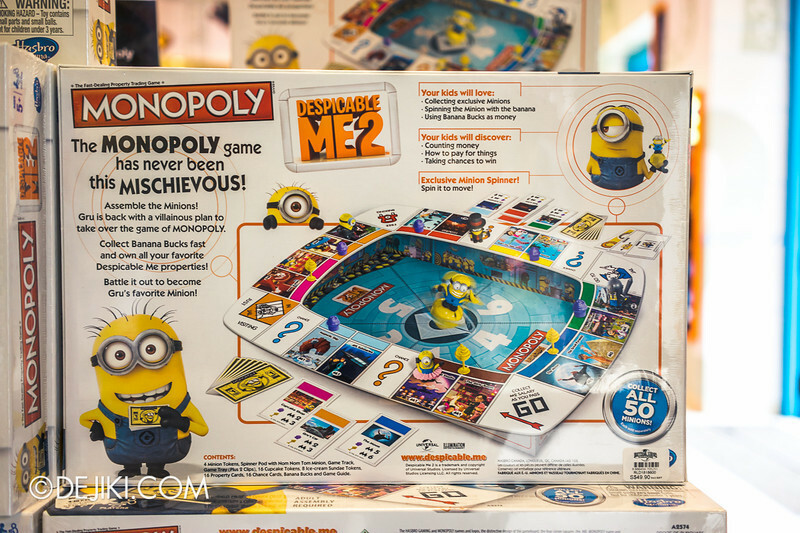 The Minions included in Monopoly are exclusive to that board game. You can find another 5 in Operation Despicable Me 2. 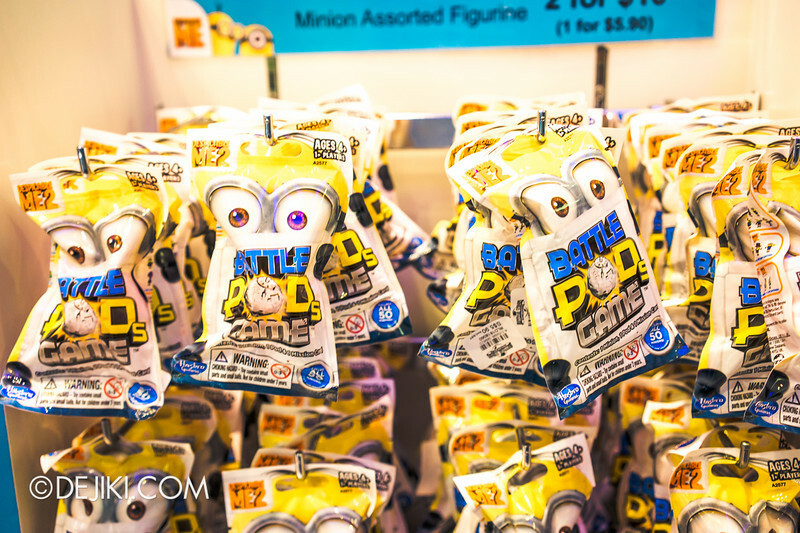 Another series of 10 figurines (with some purple Minions) can be obtained through Battle Pods Good vs Evil bags, which are not seen at the park yet. For those who know how to game blind bag toys (via the feel-feel, press-press method), the Minion bags are slightly harder because there is a plastic ball, a game card and some leaflets included in each pack. You might be able to make close guesses on the height of the Minion (or know which are the armored ones), but picking out an exact design would need skill. The park is seeking talented performers for their hallmark Halloween event. 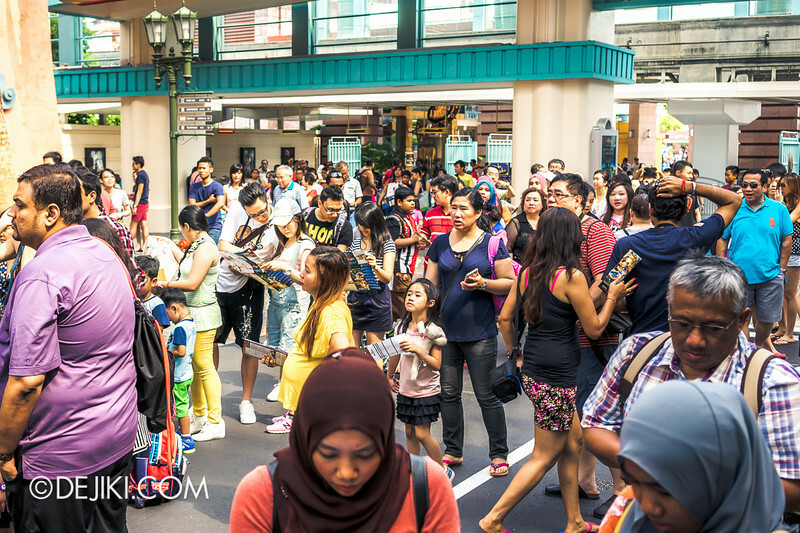 Auditions for this year’s Halloween Horror Nights will be held on 7 & 8 June 2014 at the Resorts World Sentosa Convention Centre. For more details, refer to the official Auditions page. 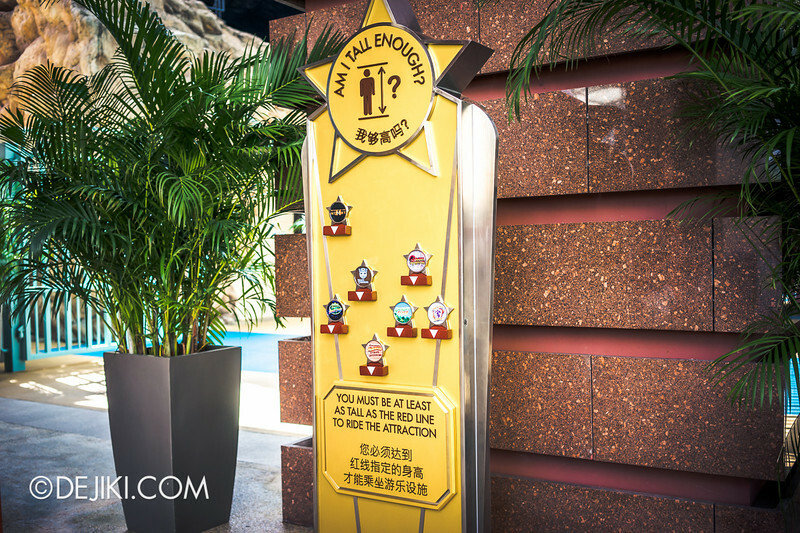 Halloween Horror Nights is my favourite USS park event, and I’m always looking forward to Universal Studios Singapore’s unique concepts and remarkable attention to the smallest details. If this is your first time applying and you need some ideas to better prepare, you’re in luck. Look through my Halloween Horror Nights archives and meet past years’ characters. You’ll also see scare zones at night, which gives a better idea of what the unusual performing environment might be like. Are there any new characters debuting in June? When I last went in May, there was no change. Still no new characters. USS getting slack. Probably won’t renew my annual pass.